Finally a mural about food! This mural is on the wall of Vetri Ristorante, one of the finest Italian restaurants in Philadelphia. When Chef Marc Vetri wished to do something about the ugly wall of his restaurant, he, with artist Ann Northrup enlisted the help of the Mural Arts Program, and this mural was born. 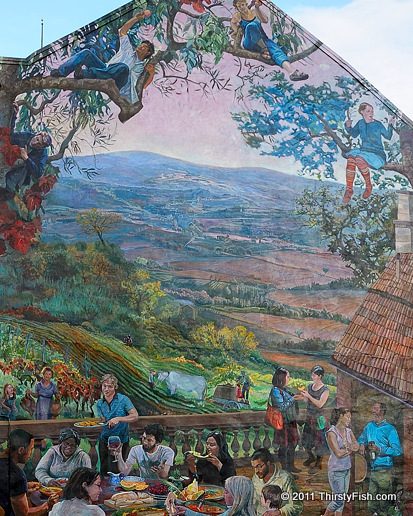 The mural portrays a diverse group of people feasting and picking fruits and is set with a countryside scene that blends Perugia, Italy and Lancaster County, Pennsylvania.